This happened to me. I messed up programming my remote for RF. This meant I couldn’t use it for IR and I couldn’t use it for RF. Well, I thought, I have the front panel, I’ll just go through the menus there. And then… I found out. At some point, the front panel stopped working. I don’t know when, I don’t know how, but pressing the front panel just didn’t do a darn thing. Now, since the DVR was broken, I could technically swap it out for another one, but I wanted to watch the programs on it. Stupid me, though, I’d turned off whole-home sharing on the DVR. So what I had was a perfectly good DVR full of stuff that I couldn’t access in any way. 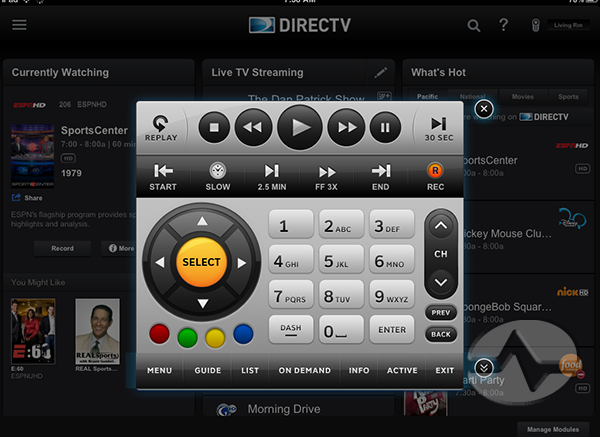 The DVR was networked, so I used the free DIRECTV App for iPad as a replacement remote. The first thing I did was go through the menus and tell the DVR to reset the remote settings. This gave me control again, and the second thing I did was turn on whole-home again in case the failure of the front panel buttons somehow grew to include the remote sensor. This worked like a charm. If you’re ever in a situation where the DVR or receiver stops responding to the remote, as long as you’re networked you have a simple way to get through to it. You can even go through the menu tree to reset the receiver and see if that helps, and that works even if the receiver is hidden or the reset button is inaccessible. Kudos to DIRECTV Engineering, and thanks for saving my bacon.